Will likely be revealed properly in a matter of hours. There have been rumours for a while now, but it's looking highly likely that Bethesda will announce a sequel to The Evil Within at its E3 press conference that takes place in a matter of hours. 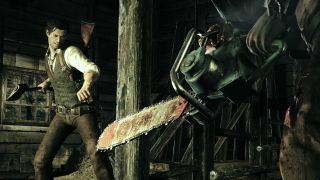 An ad has appeared on Reddit before it was supposed to, announcing that The Evil Within 2 is now available for pre-order (it isn't), while linking to the official Evil Within site, which doesn't yet have anything on it about the action-horror follow-up. "Bethesda returns you to the nightmare in The Evil Within 2. Now available for preorder. How will you survive?" "From survival horror mastermind Shinji Mikami comes The Evil Within 2. Now available for preorder. ‘The only way out is in.'" So if the advert is legit, it seems that Shinji Mikami—director of the original Resident Evil, and of the first Evil Within—is still attached, which is great news. The Evil Within was quite uneven, but it had some tense chapters, and some extremely pleasant art direction, so I'm very interested in a sequel.